1. Preheat the oven to 400°F, gas mark 6, 200°C (180°C fan-assisted). Place the large sweet potato on a baking tray and bake for 50 to 60 minutes until soft, then remove from the oven and leave to cool. 2 Place the chickpeas in the food processor, reserving 2 tbsp for the garnish. Add 4 tbsp of tahini and process until smooth, occasionally wiping down the sides. 3 Add the crushed garlic, lemon juice, water, 6 tbsp olive oil and salt and process. You may need to add 3 tbsp olive oil. Taste and adjust the seasoning. If the paste is too thick, add 2-3 tbsp of water. Scoop the inside of the sweet potato out of the skin and blend again until smooth. 4 To serve, place in serving dishes and using the back of a spoon create a well. 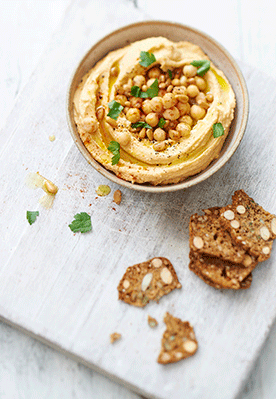 Drizzle with olive oil, sprinkle with the rest of the chickpeas, paprika, toasted pine nuts and chopped parsley. Hummus, the Arabic word for 'chickpeas', is relatively easy to make with the help of a blender and a few common, inexpensive ingredients. There are several brands of sesame tahini available and the one you choose can dramatically change the flavour of your hummus. Raw tahini can give your hummus a stronger and bitter flavour while canned, roasted tahini is mild and nutty. Recipe taken from My Relationship with Food, £22, by Lisa Roukin, available from www.myrelationshipwithfood.com. Lisa is a London-based chef, teacher and writer. Since 2008, she has run her own cookery school, Cook with Lisa, and has appeared on Channel 4 and BBC radio. She also provides gluten-free recipes to Ocado.